Use these assessments with your students to find a starting point. Then, you'll be able to write your Orton-Gillingham lesson plans to support your instruction. 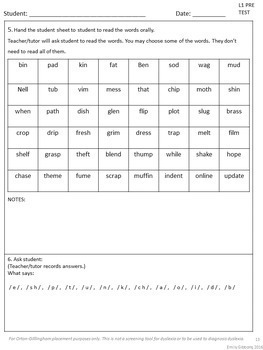 On Track was created to help you determine a starting point for your students when using the Orton-Gillingham approach, and/or dyslexia intervention with a multisensory approach. I am a certified Orton-Gillingham teacher. My certification comes from an IMSLEC approved program. I trained using the Massachusetts General Hospital Orton-Gillingham training curriculum. Finding a starting point is a very important step when beginning OG. Having the proper tools to help you make this decision for your students is critical. 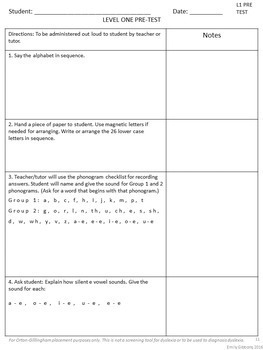 I use this resource to assess my students when they are about to begin somewhere a level, or are ready to exit a level. Once I administer the pre or post test, I carefully look at the errors and gaps. I use the progression chart to choose my starting point and begin planning my lessons based on my data. My Orton-Gillingham materials align with this resource. 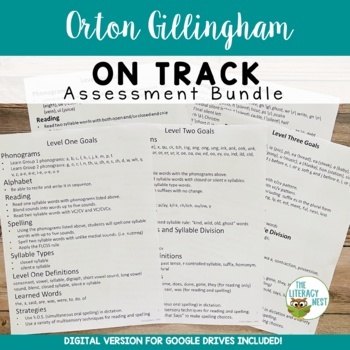 This is a growing bundle for On Track Orton-Gillingham Assessments. It is suitable for Orton-Gillingham based instruction, structured literacy programs or other reading interventions. 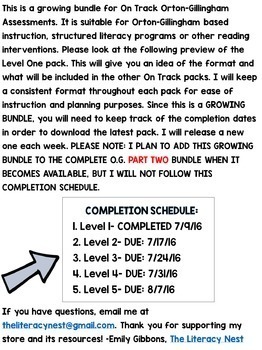 Please look at the following preview of the Level One pack. This will give you an idea of the format and what will be included in the other On Track packs. I will keep a consistent format throughout each pack for ease of instruction and planning purposes. Since this was a GROWING BUNDLE, previous purchasers should download the latest version. PLEASE NOTE: THIS BUNDLE IS INCLUDED IN THE COMPLETE O.G. PART TWO. What is the savings? Individual packs will cost $3.50 each. This bundle will cost $12 upon completion. *Diagnose Dyslexia or other reading disabilities. *Be used as a screening tool for Dyslexia or other reading disabilities.